This brief essay is supposed to provide a short and concise overview on string theory and the questions the theory aims to answer. String theory dates back to the time when the Standard Model of particle physics was still in its early stages. The strong nuclear force, which binds together the quarks in a proton or neutron was particularly difficult to understand at the time. Back then string theory was treated as just one another approach to this problem, but it never really left its basic development and was soon regarded as a worthless undertaking after the discovery of asymptotic freedom. This feat lies at the core of the theory of quantum chromodynamics (QCD for short), which is nowadays an integral part of the Standard Model and the widely accepted description for the dynamics resulting from strong interactions. String theory was left behind and only very few researchers continued working on this disfavored theory, whereas the mainstream of particle physics concentrated their efforts on working out the details of the new Standard Model. The Standard Model of fundamental particle physics is described by a non-Abelian Yang-Mills gauge theory modeled around the 12-dimensional gauge group . It encompasses three of the four known fundamental forces, i.e. the electromagnetic, the weak and strong nuclear interactions—leaving out only gravity from the picture. From the theorists viewpoint, however, the canonical quantization procedure applied to this model leads to numerous conceptual and technical problems. For example, infinities arise in many plain computations due to various reasons and have to be accounted for using regularization and renormalization techniques. Those issues can be avoided and circumvented at least for the Standard Model aspects relevant for real-world physics. This is why the Standard Model of particle physics actually deserves its name, because it gives a unified description of the entire known and experimentally directly observable microcosmos and is in very good agreement to experiment. Nevertheless, the underlying quantum field theory framework is a rather ill-defined construction which only seems to work in very limited cases and specific situations. Another drawback is the apparent arbitrariness of the Standard Model. Within its framework of (renormalizable) quantum field theories nothing singles out the Standard Model except its agreement with experiment—it is a theory like any other which just happens to describe what we observe. This aspect goes along with the huge number of about 20 constants that have to be put in by hand to get interactions, particle masses, etc. right. All those arguments strongly hint at the fact that while the Standard Model is a nice effective description of the microcosmos, it has serious conceptual and theoretical shortcomings which prohibit a deeper understanding of the underlying dynamics and the future marriage to gravity. The gravitational interaction, which is well described by the geometrically-flavored theory of general relativity, has not yet found its place within this picture. While it can be successfully reformulated as a classical gauge theory, any attempt to quantize the theory using the established canonical methods produces ill-defined theories suffering from non-renormalizable infinities. From a heuristical point of view, this may be understood due to the fact that there is only one gravitational “charge”: the absence of a repulsive gravitational interaction makes it impossible to cancel out the attractive contributions that arise in the vacuum polarization of the quantized theory, ultimately leading to the aforementioned gravitational infinities. When it was realized, that in every consistent variant of string theory there is a certain closed string state with just the right properties to identify it with the graviton—the virtual exchange particle of the gravitational interaction—interest in the old theory was renewed. And after Green and Schwarz proved in 1984 that superstring theory comes without a certain type of anomalies (signalling significant instabilities and conceptual problems in any quantum theory), research in the area of string theory really took off. String theory rejects the idea of a point particle as the fundamental constituent of the theory, which is the central concept in quantum field theory. 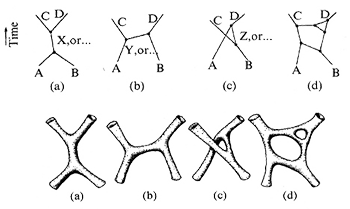 By introducing 1-dimensional, extended objects (and higher dimensional membranes in its further developments) this gives rise to a natural smallest scale in form of the string length. The average size of this string is expected to be much smaller than the smallest sizes probed experimentally, currently centimetre, and might be as small as the Planck length, which is of the order of centimetre. So when one studies string theory at low energies compared to the Planck scale, it becomes difficult to see that strings are extended objects—they behave effectively 0-dimensional, i.e. pointlike. With this perspective in mind, point-like quantum field theory can be regarded as a sort of effective theory for strings at low energies. One rather odd property of supersymmetric string theories is that it only works consistently in 10 space-time dimensions. This is obviously in contrast to the everyday experience of 3 spatial and 1 temporal dimension, thus 6 dimensions have to be accounted for somehow. In most approaches to this issue a solution is achived by rolling up (“compactifying” as the physicist says) the additional dimensions to a very small size. For example, rolling up each additional coordinate to a circle gives a 6-dimensional torus, but one may also consider much more complicated compact 6-dimensional spaces. The geometrical properties of those compactified dimensions are crucial for the resulting 4-dimensional effective theory on the remaining 3+1 flat coordinates. Furthermore, if there are higher-dimensional objects like D-branes in the considered configuration, those may wrap around certain parts of the compactified coordinates, which dramatically changes their respective physical properties. In essence, shape and geometry both of the space-time and the objects propagating inside of it govern everything in string theory. Hopes to observe stringy effects in current and future accelerator experiments are—unfortunately—vague and rather speculative at the moment. Another problematic aspect of string theory is the necessity (sometimes interpreted as a prediction, depending on one’s viewpoint) of space-time supersymmetry, for which there is at the moment no experimental indication whatsoever aside from its striking conceptual and mathematical appeal. Nevertheless, the terms string theory and superstring theory are used synonymously nowadays, as most of the non-supersymmetric string theory constructions are highly unstable and/or inconsistent. Whereas all five perturbative string theories are defined on 10 space-time dimensions (with 6 of them usually being compactified on Calabi-Yau spaces), M-theory lives in 11 dimensions. According to one approach to the theory, it can be viewed as developing an additional dimension when approaching a certain strong-coupling limit of the Type-IIA string theory. Strings get replaced by membranes, which wrap this additional coordinate. 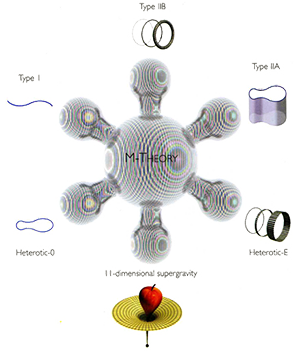 Those so-called M2-branes along with several other new ingredients induce a great variety of additional effects, some of which only have a non-perturbative description from the perspective of the individual string theories. As a bottom line, M-theory is still a rather elusive construction and at this point does not have a complete formal description like its limit string theories, but due to the striking duality web no string theorist seriously doubts the existence of such a deeper theory in the background. It should be pointed out that M-theory is not “more” of a theory than its limit string theories itself. From a certain perspective it simply provides a more unified description of stringy effects, whereas in the perturbative string theories most of the non-perturbative ones have to be brought in by different further ingredients (D-branes, string junctions,…). In this sense M-theory is the theory in which the non-perturbative effects have a much more natural description and do not appear to be as artificial as it is the case in the limit string theories, but this comes at the price of a much more difficult and incomplete overall description of the theory itself. Many further properties of string theory are interesting on their own. There is the famous AdS/CFT correspondence, which was originally found in the context of string theory on anti-deSitter space-times—it has become an important tool in e.g. condensed matter physics, an area of physics which is pretty remote from the original outlet of elementary particle physics. The computation of the Hawking-Beckenstein entropy formula for extremal black holes via string theory is usually regarded as a huge success. In the meantime, geometrical results and consistency requirements from string theory have developed into their own mathematical branches as mathematicians became intrigued by the implications. In general, the rather sophisticated technical level required to do string theory also sparked a deeper investigation of related areas like quantum field theory, conformal field theory and algebraic geometry—all of which are deeply connected and interconnected to other branches of their own.